Small-game hunting seems easy, and it can provide fast shooting and results. It can also be a frustrating endeavor that leaves you humbled, because after all, who can’t pop a few squirrels with a .22 any time they want? The answer? A lot of us – if we happen to put our backs to a tree in the wrong woodlot. The same goes for an afternoon of rabbit hunting. If you’re in the wrong cover, you’ll spend too much time hiking and too little shooting at sunning or fleeing rabbits. Recognizing the right haunts to spend your time for each critter is the best way to maximize your small-game season. SQUIRREL! When hitting the hardwoods for a bushy-tail hunt, look for a tree (or clump of trees) littered with signs that squirrels have been feeding there. Nothing? Then sit back and watch. When you start to see them move, get ready to still-hunt closer. Finding hardwoods is a no-brainer when trying to fill our game bags with bushy-tails, but what if you’ve got a 40- or 80-acre tract of timber that is largely hardwoods? Then you need to scout out one tree or one patch of trees that the locals are working. Watch for oaks or walnuts littered with the detritus of many squirrels chomping at the nuts. If there is snow on the ground, you should see squirrel tracks and trails leading to it. Back up to a nearby tree, take a seat and get ready. If you’re in a chunk of woods that doesn’t feature a can’t-miss squirrel buffet, look for a spot that allows for observation. Squirrels cover more territory than most of us think while foraging for food, and they’ll take the same routes from spot to spot. 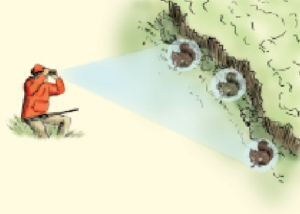 Put your back to a tree on a ridge, or along the outer edge of a woodlot and carry binoculars. When you start seeing squirrels, start creeping. Eventually you’ll end up where the bushy-tails want to be. High-traffic rabbit haunts are easy to find. Bunnies leave a lot of signs, and that means locating their hideouts is as easy as looking for tracks, trails and droppings. This is where the easy part ends, however. You’ve still got to get them moving, which means wading into the thick stuff. If you’ve got a 10-acre patch of cover, they may just scamper from one brush pile to the next without showing themselves, so try to find rabbit signs in a fence row or thinner strip of cover. That way, getting a shot becomes a higher probability. If you have that big chunk of cover and want an exciting hunt, try still-hunting. Overgrown homesteads, brier patches and areas where logging or tree-snapping high winds have occurred in recent years allow you to test your still-hunting skills. Take a scoped .22 or .17, and wait for the last hour of legal shooting light. Then slip along while looking for a bunny trying to blend into the scenery.